Known to be the most sacred river in India, the Ganges River is famous not only for being the center of most religious rituals, but also for being historically significant among Indians. It is the longest river that runs through India and empties into the Bay of Bengal in the southern part. It also borders India from Bangladesh as it rises in the western Himalayas and passes through the Gangetic Plain. Its religious significance is well-known as many mythologies are attributed to the presence of the Ganges River. Hindus are known to worship the river, associated with the Hindu goddess Ganga, which provides the daily needs to those who call it home. Traditional and religious rituals are often associated with this holy body of water as well. Ancient Hindu texts found in the Ramayana, the Mahabharata and several other Puranas or narratives on the creation history in Jain, Hindu and Buddhist tells the story of how the Ganges came to be. In the Vedic version of the creation history, it was Indra, Lord of Svarga (heaven), who slew Vritra (the celestial serpent) that subsequently released the celestial liquid (soma) known to be the nectar of the gods and them plunged it to the earth as its waters gave sustenance to other creatures. Devotees and pilgrims are known to bathe or take a ritualistic dip in one of the almost one hundred ghats that lead to the Ganges River. This tradition is shared by the many different religions such as Jainism, Hinduism, Buddhism and Sikhism that is practiced around the city of Varanasi. The belief is that when an individual bathes in the holy waters of the river, he will gain punya or merits and would be cleansed of all sins. This is possible by cupping their hands filled with water and slowly pouring it from the body back to the river while giving thanks to the ancestors and the gods and goddesses. Hence, devotees and pilgrims flock to the many ghats around the Ganges to perform the ritual before going to the numerous temples nearby. 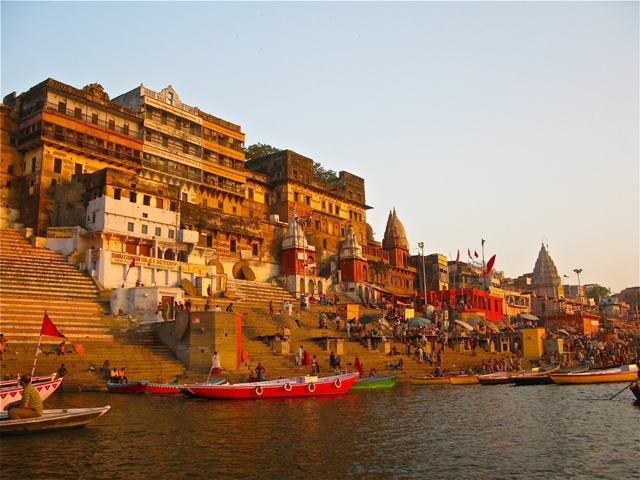 Tourists or visitors will enjoy the grand view of the Ganges in Varanasi by taking boat rides or a Ganges cruise. The best time where the magnificence of the river can be captured is during the evenings or during important celebrations such as the Avatarana or descent of the Ganges from heaven to earth, which happens during late May to early June every year. On the tenth day of the celebration known as Ganga Dashahara, many bathers converge in ghats along the river to rid themselves of the ten sins. For those who are unable to bathe in the Ganges River, their sins can still be absolved by taking a dip in other bodies of water. The Ganges River is also believed to be a lifeline to millions of Indians living along the riverbank. For thousands of years, the river has provided the people living nearby its daily needs and sustenance. Its heavily populated riverbanks amounted to approximately four hundred million residents to date. There are numerous environmental efforts to preserve the river with joint initiatives by the national government, non-government organizations, environmental organizations and foreign preservation organizations. Thus, the Ganges River is seen to benefit more and more generations to come.